We are kicking off our Fall series of Civic Lunches with a talk by James Rojas. James is an urban planner, activist, and artist, who uses participatory processes for community based design, has facilitated hundreds of workshops, created many dioramas linked to the built environment, and done lots of work in general to link communities to urban planning. James gave a talk over lunch and then gave a workshop during our research meeting to help us think about how to re-design the Civic Media workspace. Liveblog of the event by kanarinka, mstem, oddletters, and schock – all errors ours, and please let us know if you have corrections or additions! James is a graduate of MIT DUSP, and has been an urban planner for the past 20 years. He details how it’s hard to engage the public in planning. Planners go to school and learn how to read maps, and an abstract language of planning, but the public has no idea what planners are talking about. He’s been to planning meetings where people spend 20 minutes trying to find their house on the map. He started working with lots of artists in Los Angeles, and was incredibly impressed by their styles of public connection and engagement, for example with gallery talks. This got him started thinking about how planners can learn from artists to connect with publics. As a first step in this direction, James started doing workshops in his gallery. As a child, he built model cities; bringing this process into the public created high turnout. He took a class on pedagogy, and started thinking about how model city building could be a concrete process to engage people in the planning process. The idea is simple: everyone is a planner. Everyone has a relationship to the city, and uses it in certain ways. It’s our job to get people’s ideas to the surface. 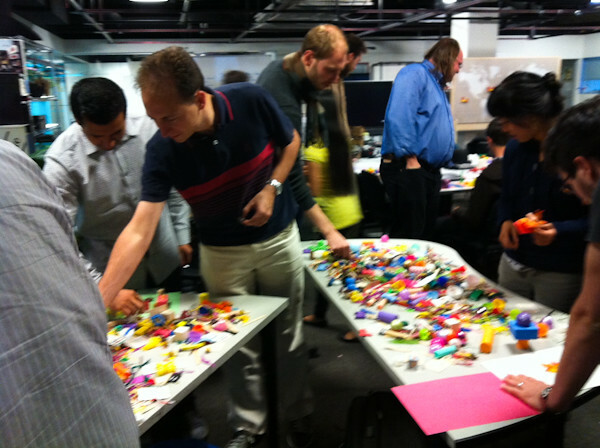 James Rojas: City as Play 6-Step Design Workshop from Gilda Haas on Vimeo. He shows an image of Cesar Chavez, who thought of everyone as an organizer. .
James’ workshops begin with simple objects that people feel at home with. He provides materials like hair rollers, bottle caps, everyday objects. Workshop participants choose whichever objects they like; some people are drawn by color, or by texture; whatever they’re most interested in. People play for 20 minutes or so after being given a prompt like “What is your ideal city?” or “Design a public space for your kids and grandkids”; there are no right or wrong answers: people reflect on their lives, build elements of the city that impact their lives, and explore. Then, everyone has 1 minute to present their idea. Through this process, participants get passionate about what they’ve built, and that’s part of the goal: to get them hooked in, and feel like they are part of the process. Next, participants present their ideas. For example, one group of Latina women built a popsicle-stick rendition of the US-Mexico border. The model helps us visualize the burden of their long days and difficult commutes. Words like ‘sustainability’ and ‘walkable’ are given life by the designs. After that, they work together for 15 minutes in groups to solve a bigger problem. It’s another open ended scenario, where they can solve any problem they’re interested in. He shows an example of a street that a group wanted to improve, with small shops, bike paths, and so on. It’s a conceptual redesign of their own street. So the goal is to get people connected to the idea of what urban planning is all about. The workshops are well-documented, with notes and photos and butcher paper. Another output is that participants learn about the planning process, and develop a sense of ownership over the process. The workshops expose the different ways people see and use their spaces and neighborhoods. Since James’ main workshop mode is to create models of the city, built from everyday objects, one of the outcomes is moveable buildings. The physical models, which are fluid and easily malleable, allow people to understand that their physical environment can be transformed, and that their input can create change. For example, he worked with Latino kids in Pasadena, took them on a rail tour, and asked them a series of questions: “Would you take a date here? Would you want to go here?” He then asked them to build a physical model of the railway line out of butterscotch candies in a sort of Gingerbread City, and prompted them to think about what was missing. Teenagers expressed different desires for the space than traditional urban planners: more Forever 21s and basketball courts, please. Rojas continues with a series of examples, and details how the experience of the workshop changes based on place. For example, responses differ depending on whether people are invited to engage with the models in the outdoors or inside a space. Once you are inside a room, the experience of the city becomes abstract. He has conducted numerous workshops outside which invite people walking by to engage with the models. This has included work with social movements like Occupy Wall Street. Kids have no problem picking up the building blocks; it feels like playtime. We need to validate and learn from their involvement. Their senses drive their life: kids tend to design for a lot of flowers and petting zoos. Rojas experiments with different prompts to invite people to engage with the process in different ways. For example, build your ideal city. Or build something from your memory. He shows examples from workshops on Park(ing) Day in Cambridge and in NYC, in Tijuana, and at the World Urban Forum where non-English speakers engaged with the models. For Rojas, this interactive planning processes empowers and educates the public. 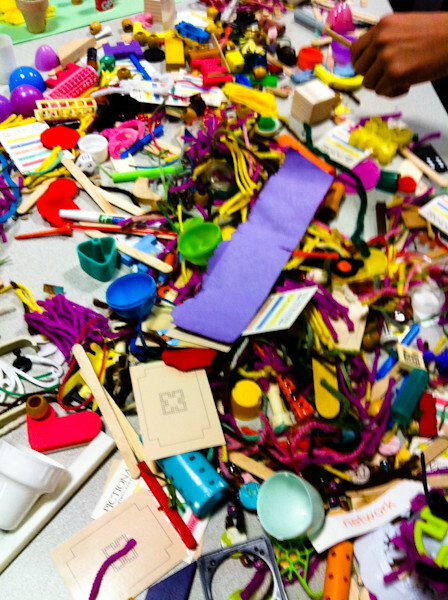 The objects and unexpected situation attract attention, build community trust, and create a shared task across language, age and professional barriers. Because the visual component is so strong people remember what they built, create new emotional relationships to the space around them and learn ways to question urban authorities about their public spaces. kanarinka: I love the look and feel and visuals of these models and this process. What about urban planners? Have you been able to bring them to the table? JR: It’s a hard sell. Planners are intimidated by the process. They’re control freaks, and are scared of the outcome. I tell planners “This is an art project, a creative exercise to get ideas out there.” It’s like an environmental impact assessment. You want to capture everything and get people involved. Rahul: I came out of http://llk.media.mit.edu/”>Life Long Kindergarden, and we love these activities, embodying your thoughts in the physical. In Data Therapy, I do something similar. But I’ve run into something: the people I talk to have forgotten how to play. How do you deal with that? JR: Older folks are difficult to play with. Last night we were at the senior center. Kids will just play, adults you have to coax. R: Examples produce copies of examples. Sasha: Are there cases where these workshops have led to change in the city? JR: The City of LA did work with results of workshops and include them in a policy document and there are other cases where it has led to consideration in field of architecture and urban planning. He also often works with museums and galleries where the point is more about the intervention and the experience rather than the outcome. Sasha: What about cases in which a developer just wants to produce consent for their design? Sometimes quick, participatory workshops are used to engineer consent for things that have been already decided. JR speaks about the importance of including these workshops at the beginning rather than the end of the planning process. There’s a challenge as well to sifting through the data for different groups. The challenge is how do we engage with what the public wants out there? JR: That happens all the time! We just did a workshop in Phoenix, and now the community is showing the model to various stakeholders: the mayor, the city council, and so on. JR: I think that could work well. Neighborhoods could crowdfund, say, to put a bike rack near a bus stop. Rodrigo: I worked at a crowdfunding startup, and the ideation stage was often the most difficult. This could really help with that. Matt: I couldn’t help but think about SimCity in relation to these workshops. Although I’m often skeptical of games for change I wonder about ways to put this into an online environment. JR: I’m not sure you could replicate this in the computer because so much happens based on what’s going on in the space around you, learning from others, and sharing designs. SC: This makes me think of the sandbox over in Tangible Media, where sculpting in the sandbox generates a 3D contour map in realtime. You could bring these objects into that interface. Matt: That also lets you understand sunlight, wind, bring in additional systems elements and understand how your design will affect them, in real time. JR: This process isn’t about numbers, it’s an open format for creativity and involvement. Becky: What’s your next step from here? What aspects will you next focus on for the project? JR: My goal is to figure out how to change the planning process in the US and potentially even the planning process in the world. I’d like to make it more open source so that more people could run these workshops on their own. Audience member: This work reminds me of the Center for Urban Pedagogy, who make toolkits focused on current policy issues. JR: CUP does great work. They do more infographic and design work, it’s really good. This is more of a process: how to gather people together. I’d love to make a toolkit, to explain how the process works. Planners have a hard time conceptualizing this. kanarinka: This came up yesterday: What makes for a good prompt? You mentioned some examples of good prompts; are there ones that failed, or were wildly successful? JR: The best ones are really simple. As a kid, they jump in before I even start. For adults, I have to really push them. “Here’s a building.” “What building is it? Where do I put it at?” The kid will run to the model and start playing, the parent will say “Don’t touch that!” I find that people just engage via the materials. “There’s a hair roller, a salt shaker,” and so on. You need multiple prompts. I never use square blocks: it’s too familiar. People get concerned about the block pattern; round things seem to fit a more flowing model. Squares, like legos, get you worried about the pattern. Women will be attracted to textures and colors. Males will be very conceptual. Women will personalize more: here’s my street, here are the objects I know. Many people use narratives. SC: Do you ever capture or record the stories? JR: Not so much; we’re interested in the planning process, the model. SC: Perhaps that could be an exciting collaboration if you come here next year; to work together to capture the stories people tell about their places. kanarinka: Kevin Lynch was an urban planner who invented the term psychogeography, went around interviewing people about their cities and spaces, how they construct mental models of their cities. I’ve always been interested in the way he validated people’s everyday experience of their cities. Is there a relationship there or did you study his work while you were at MIT? JR: Kevin would have used this stuff if he had it! Charlie de Tar: Lynch was interested in multiple perspectives of how people experience the city. The perspective of all these models is a top down, bird’s eye perspective. Have you worked on other perspectives? JR: The dioramas are more street level. Planners don’t think about the public; it’s about zoning codes and whatnot. People here talk about the street experience, the water slide, their dog, interactions with the built environment. Q: As a planner, do you do environmental study first? At what stage do these workshops come in? JR: This would be part of the environmental impact reports. You’ll see patterns. I did a workshop w/the new LA city planning director about LA 2050. He was saying ‘how come we don’t get this at public meetings?” Because they’re asking the wrong questions, it’s all about tomorrow. But ask them what they want in 20 years, and work backwards from there. It’s about values, and shared emotions about space.